The West Coast has earthquakes and forest fires, the Midwest has tornadoes, and the South has hurricanes. “But here in the Northeast,” said Kevin Esvelt, an evolutionary biologist at the MIT Media Lab. “Lyme disease is our natural disaster.” More than 300,000 people in the United States are diagnosed with it each year. That work grew out of Telford’s early ’90s studies at the Harvard T.H. Chan School of Public Health identifying an antibody that makes mice resistant to Lyme, which ultimately led to the development of canine and human vaccines for Lyme. (The manufacturer took the human Lyme vaccine off the market due to controversy over now-disproven side effects.) At Tufts, Telford and Hu also have successfully vaccinated white-footed mice so that ticks that bite them fall off before they have a chance to ingest their full meal of blood. Esvelt thought if his research team could clone the antibodies that make vaccinated mice Lyme resistant, they could use CRISPR technology to create and breed mice that are born already producing those protective molecules. “That’s not normally how the immune system works,” Esvelt said, explaining that acquired immunity from antibodies isn’t normally passed on to offspring. CRISPR will permit these scientists to encode antibodies from immune cells into mouse reproductive cells, so that immunity can be passed on to future generations of mice. Telford estimates that releasing the genetically altered white-footed mice could greatly reduce the transmission of Lyme disease on Martha’s Vineyard and Nantucket. Telford has spent three decades trying to get these communities to implement Lyme-fighting measures, from promoting consistent use of insect repellants, to culling deer, to spraying insecticides onto the mice that carry Lyme. But progress in the battle has long been compromised, on the islands and elsewhere, by a lack of sustained public funding and interest. “HIV was just as new as Lyme disease when I started working on it in graduate school,” Telford said. “Now, although we’ve made great strides in preventing and treating HIV, we are seeing more Lyme disease infections in more places every year.” This new approach may finally offer a one-time, long-lasting intervention. Since 2016, Telford has provided the MIT lab with white-footed mice immunized against Lyme. After many twists and turns in trying to demystify the molecular biology of the native species, the researchers have isolated antibodies that provide protection against the Lyme bacterium. 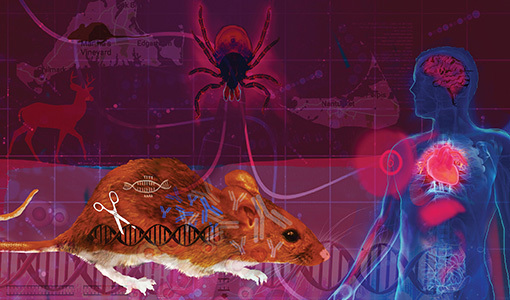 According to Mice Against Ticks project manager and research assistant Joanna Buchthal, the team now expects to identify additional antibodies that are even more broadly protective against Lyme disease, as well as ticks themselves, within a year.